Oregon getting physical? We all know that the national narrative referred to the Ducks as soft and this game went a long way to refuting it, but how? What was the game plan that Coach Helfrich used to defeat the Spartans? There is an enormous amount to cover, but today lets look at one of the staples of the Oregon offense that helped beat Michigan State and we have not reviewed in a long time, which is the Power Play. 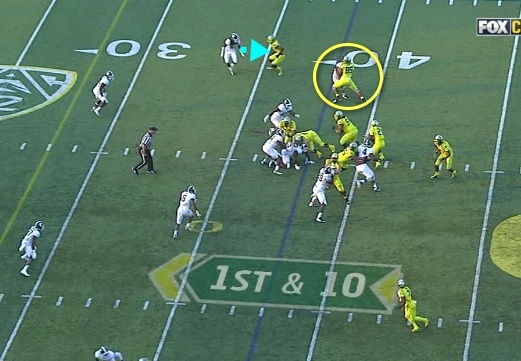 New RB Royce Freeman is a natural for this play as he demonstrated it to us later in the game, but Coach Frost threw in a new variation of the Power Play for us to marvel at of which would work well with all the running backs. Another surprise for Coach Cam Pettus in Illinois (who was consulting on this analysis with me) was the impact on the play by what appears to be a peripheral player. Interesting things to learn and contemplate! 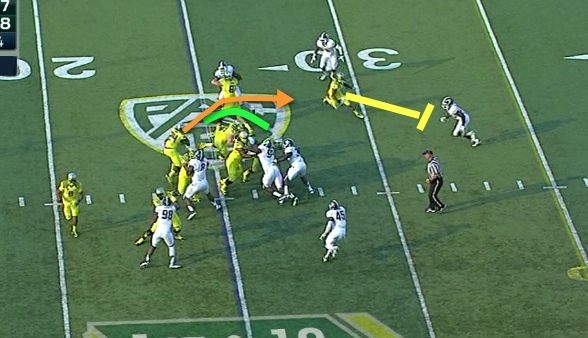 The Power Play at Oregon is meant to be an ancillary or complementary play to the Inside Zone Read. In the screenshot above-you see that if the running back follows the orange arrow, then it would be an Inside Zone Read, but if the RB follows the yellow arrow–it is a Power Play. 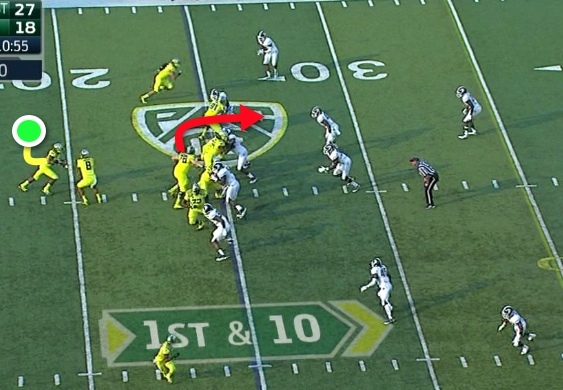 The running back (above) is following a similar path as Oregon New Inside Zone Read (more on that another time) and will be following the path of the pulling guard, redshirt freshman Jake Pisarcik, who is the red arrow. 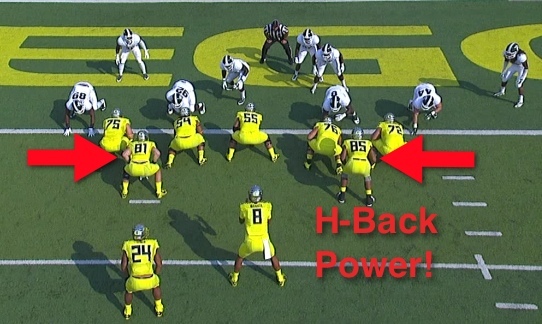 The center Hroniss Grasu, is blocking the defensive tackle to his right, while Jake Fisher and Hamani Stevens are blowing up the defensive tackle on Oregon’s left side. The amazing efforts of the offensive linemen have created a green wall (above) and a lane between them and the wonderful block by Evan Baylis (at top of Pac-12 symbol above) on the defensive end of Michigan State. 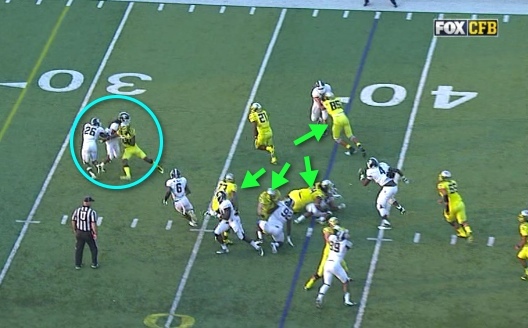 The Duck wide receiver is coming inside to block the free safety while Pisarcik has nailed the MSU linebacker. Looking good! 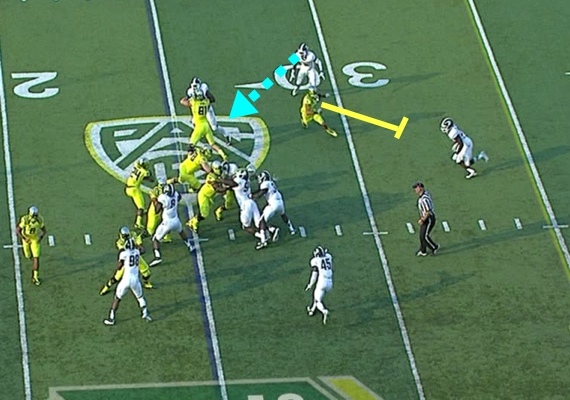 Thomas Tyner blasts for ten yards as the Spartan corner is the last one to be able to make a play (above) and does. There is nothing tricky or finesse’ about this play as it’s “Big-Boy” football to the fullest. This play is very physical and success is determined by making or defeating blocks. This example is the same play and blocked the same way as when LaMichael, Kenyon, and LaGarrett ran this play! 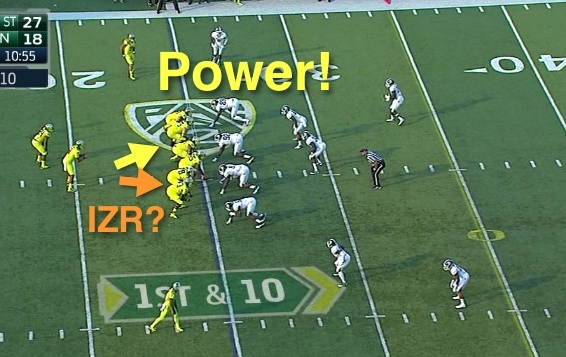 Later in the game Oregon runs the Power Play again, only this time with Royce Freeman at RB, and Cameron Hunt at right guard. 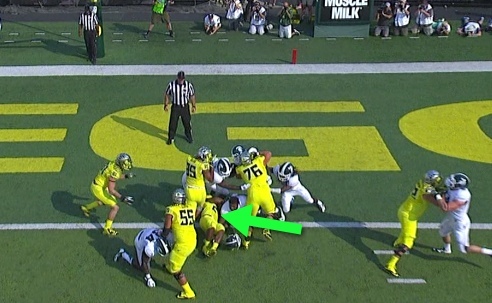 Hamani is superb at pulling and destroying LBs, and he’s looking to do it again (Red arrow above). 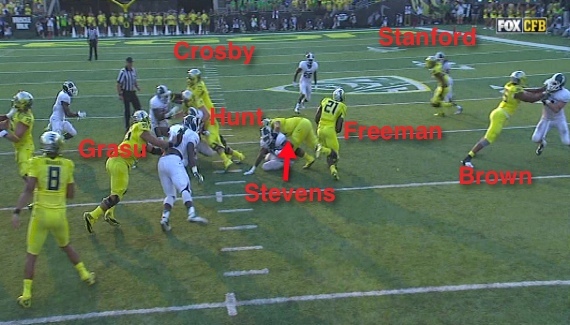 Note how the MSU corner is intent upon Dwayne Stanford, the Oregon wide receiver, as it appears he is running an inside route for the corner to keep track of. This is a familiar sight (above) as Stevens is leading the RB in the wide open hole created in the line. Again we see great intent of the corner on the WR of Oregon because Stanford sold the MSU defensive back on a pass route being run. The block by Brown again on the outside is difficult for most Tight Ends because of all the wide open space, an athletic outside linebacker or defensive end can usually break free of the block. Pharaoh is an undervalued part of the Duck running game! This screenshot of the second Power Play example leaves an old offensive lineman like myself panting; look at all the Michigan State defensive linemen on the ground or driven out of the play (Green arrows above)! The light blue circle shows how Stanford’s care in selling the pass route pulled the corner into the safety as Dwayne went to block the safety, thus the corner was completely out of position to make the tackle. Royce Freeman (#21) is off for another touchdown run! Complete Teamwork and blocking by all! Imagine my surprise with two tight ends, (also called H-Backs in this situation) line up behind the “B” gaps of the offensive line! Interesting! We see how Pharaoh Brown (#85 above) has pulled to the left to meet the oncoming linebacker who plans to stuff this run. Evan Baylis (the other TE #81 above) is going to help with blocking the defensive tackle and can slide off to help with a LB if there is penetration into the “B” gap on the left side. Wow this is physical, tough football! Brown is playing smash-mouth with the MSU linebacker and everyone else on the offensive line is pushing their defender forward. Thomas Tyner (#24) is slipping into the crack in the defense to score! Tyner is into the end zone (above) and Jake Pisarcik is driving two defenders back. No wonder he is playing so much at this stage! 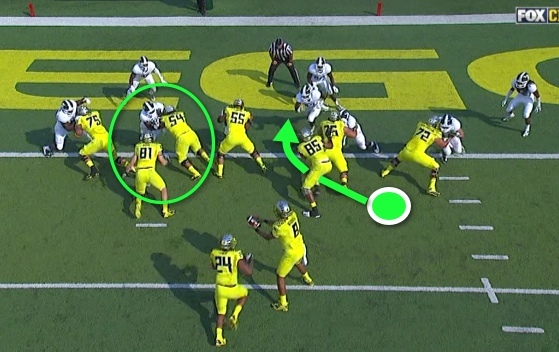 So many studs on this offensive line, and what a great variation of the Power Play to utilize our strength of so many great tight ends at Oregon. My friends, I do invite you to watch the short video made about the Power Play on FishDuck.com as nothing much has changed in the three years since I created it. In fact this play has been around as long as football has, as I’m sure Shy Huntington used it to win the first Rose Bowl for Oregon over 100 years ago. 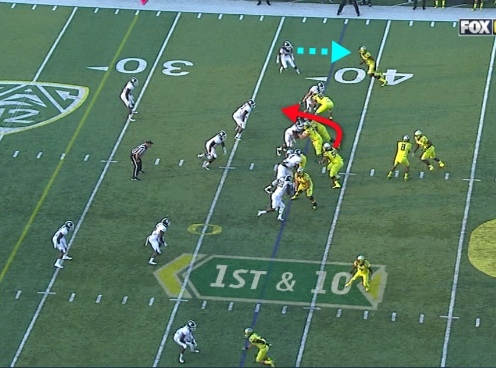 Great blocking with a head of steam will never change, but the Ducks have made it explosive with efforts of the WRs to fool the defensive backs with their pass routes. 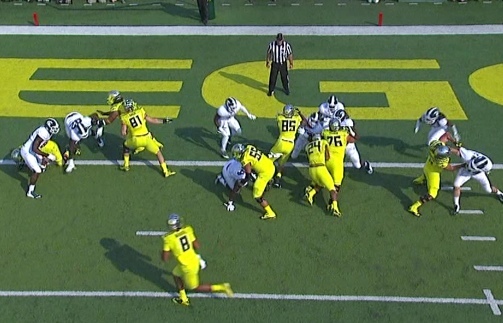 A little crease when the defense is fatigued is all it takes for another Oregon blockbuster play!